My husband is terribly allergic to cats. His brother, who lives a mile from our house, has many cats. Michael has only been to his brother's house once, while it was being renovated and the cats were all kept in a single room, off limits to Mike. Uncle Mitch owns every game system there is, and enough video games to stock a small store. Knowing this, the boys have begged for years to go there. But because of the cat situation, it wasn't really possible unless we wanted Michael to have a miserable asthma attack along with his eyes swelling shut. Until now! With Michael away, Mitch asked if the boys could come play this afternoon. They were so excited! And then Mike and Mitch's sister Holly called up this morning asking if she could take the boys to the Farmer's Market and park. She said she'd deliver them to Mitch's when he got home this afternoon. And then my friend Jenny, who used to live here but then moved up near my parents, called to say she was in town and wanted to come help me with packing! With the boys gone, Jenny and I got rid of the contents of six boxes and sorted stuff to keep into new boxes. I'm not sure which of the three Stateside Chases were happiest today! The boys had a blast, and when I asked them what was the best part about today, they weren't sure if it was the Famous Nathan's Hot Dogs at Farmer's Market, the tree house at the park, video games with Uncle Mitch, hanging out and being able to pet so many kitties, or the Popsicles that Auntie Jamie (Mitch's wife) gave them. Funny enough, those boys tricked all of us into feeding them multiple meals today! They ate two breakfasts this morning (one before I got up, one after I came downstairs), Auntie Holly got them lunch plus plenty of snacks at Farmer's Market, and Mitch and Jamie made them sandwiches and snacks at their house, followed by me feeding them a huge dinner because they told me they were starving! Hmmm... yesterday Nathan slept for fifteen hours, today he ate five meals plus lots of snacks... maybe he's part bear and he's going to hibernate for the... summer? Nah! Just growing boys, I'm sure. They do feel loved, and that is the very most important thing of all. Boys with their toys. Uncle Mitch on the left. 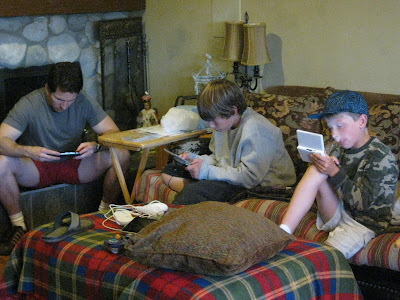 ﻿﻿ As we were walking down the sidewalk to our car from Uncle Mitch's house, he came running after us, with a Super Mario 64 game for the DSi. He said that he never really plays it and he was willing to part with it. Both boys were speechless at their good fortune! This is a game they have both really wanted and talk about all the time. And now it's theirs! Their bedtime prayers tonight were filled with more gratitude than I've ever heard from them before. And because I got to spend hours and hours with my dear friend Jenny, laughing and talking and being very productive, I'm sure mine will be too! 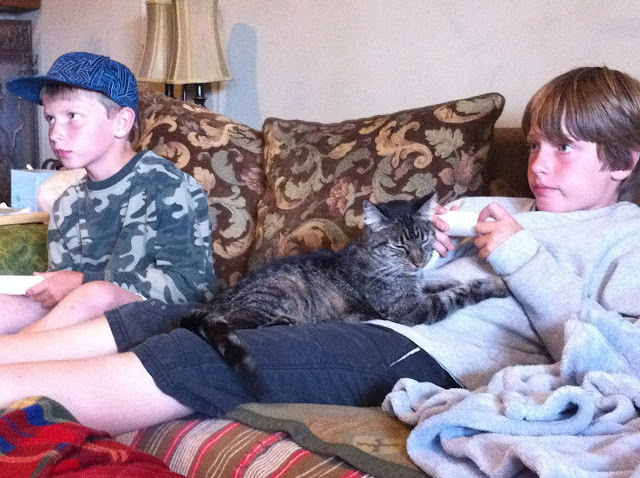 I love how the cat is laying on Nathan but Nathan is in a wii coma and really isn't even paying attention to the cat. I've seen that look before :).